Still Playing on Yahoo Chess?? Unlimited Free Chess Games! Play rated & unrated games for FREE on our Live Chess server anytime anywhere. 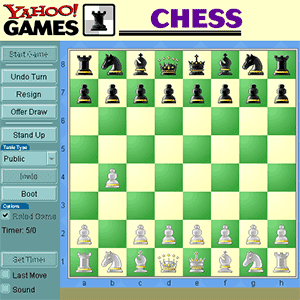 Or if you want to take slow, play turn-based Online Chess online or on your mobile! Tons Of Tournaments! Test yourself with Chess.com’s Live & Online Chess Tournaments which start every few minutes! Get a trophy when you win any of the top 3 spots. Grandmaster-Level Instruction! Our team of grandmaster trainers are working non-stop to create top-level lessons and videos. You won't find that on Yahoo! Join Now — It’s Free & Easy!